A fund-raising walk in aid of local charities is being held in Petersfield on Saturday (May 12th). The Charity Walk for Peace enables walkers to enjoy the three-and-a-half mile route around the town. 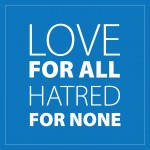 Organised by East Hampshire District Council and the Ahmadiyya Muslim Elder Association (AMEA), the walk will promote the ‘love for all, hatred for none’ motto while also raising money for nine charities working in East Hampshire. This year’s Walk for Peace will raise funds for Artscape, Challengers, Rosemary Foundation, Fitzroy, Home-Start WeyWater, Home-Start Butser, Age Concern Cowplain, Dementia Friendly Petersfield and The Kings Arms. The event will be the second in East Hampshire: last year’s raised more than £7,000 for local charities. All participants will be treated to a lunch by the AMEA once the walk has been completed. Rizwan Khan, Regional Chairman of Charity Walk for Peace, said: ““Our aim is to relieve the suffering of the poor, to promote peace, understanding and goodwill amongst people of all walks of life. “We want to help society and to support charitable endeavours and demonstrate loyalty to country and nation. The distinctive feature of the charity walk for peace is that all organisers are unpaid volunteers and there are no administrative costs. Every penny raised goes to charity. The walk will begin and end at EHDC’s council offices at Penns Placeand will start with an opening ceremony at 10.45am. The walk is open to anyone. To register, visit https://charitywalkforpeace.org and click on ‘Upcoming events’.